They’re crunchy like crackers, sweet like cookies, and have been delighting kids around the world for more than a century. We’re talking, of course, about animal crackers, the itty-bitty zoo denizens that are so nostalgic and addictive that they have their own specially dedicated holiday. 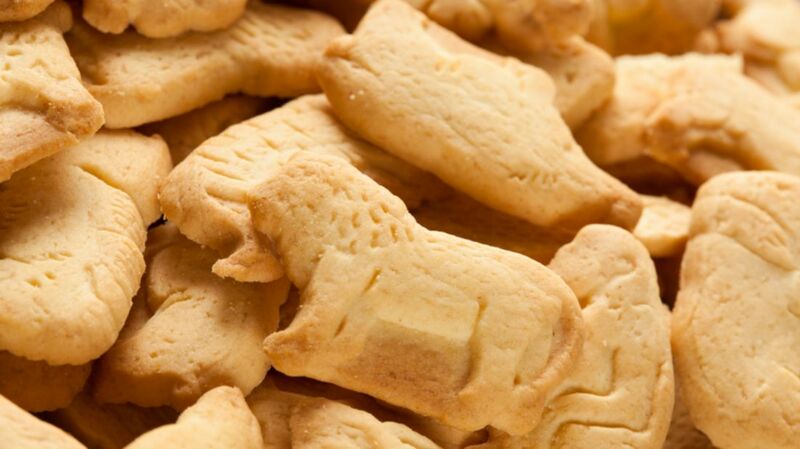 April 18 is National Animal Crackers Day, and to celebrate this wholly made-up (but wholesomely fun!) day, we’ve dug up 11 tasty tidbits about the bite-sized snack beasts. 1. THE ANIMAL CRACKER WAS BORN IN ENGLAND. As early as the 1800s, animal-shaped cookies (or “biscuits” as they’re known in the U.K.) were being devoured across the pond. They became so popular that Americans wanted a piece too, and stateside bakers began experimenting with their own recipes. The earliest known of the so-called “animal” recipes to pop up was in an 1870s publication called Secrets of the Bakers’ and Confectioners’ Trade, written by J.D. Hounihan. The term “animal crackers” refers to a type of snack and not to a particular brand. In fact, there are several U.S. manufacturers that produce the treats. Stauffer Biscuit Company was the first in 1871, and they’ve been using the same recipe for their version since the turn of the 20th century. Today, more than 40 million packages of animal crackers are sold each year around the world and are exported to 17 countries. 3. … BUT NABISCO’S ‘BARNUM’S’ REMAINS THE MOST POPULAR. In 1902, Nabisco began selling what they called Barnum’s Animals. Named after one of the country’s greatest showmen, P.T. Barnum, the circus-themed crackers were the first to be sold in a small, snack-size package; before then, all crackers were sold in bulk from a barrel (which is where the term "cracker barrel" comes from). Meanwhile, Barnum—arguably the most renowned self-promoter in history—wasn’t in on the box that bore his name and, to this day, the Ringling Bros. and Barnum & Bailey Circus doesn’t get a cut or a licensing fee. 4. THE ORIGINAL BARNUM’S CARTON WAS INTENDED AS A CHRISTMAS ORNAMENT. The familiar circus-train package, with its bottom wheels and handle on top, has been in play since Nabisco began manufacturing them more than a hundred years ago. Originally conceived as a Christmas gift-turned-ornament, the package was meant to be hung on a Christmas trees by its string. 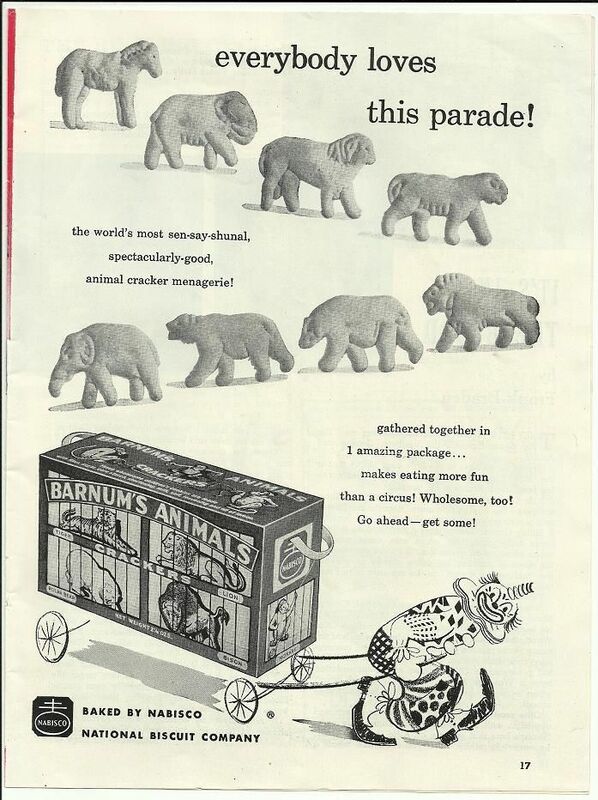 At the time, boxes of Barnum’s Animals crackers cost 5 cents a pop. 5. EACH YEAR, 8000 MILES OF STRING ARE USED IN THE PACKAGING. Each shift at Nabisco’s New Jersey factory uses approximately 30 miles of string for the handles at the top of the cartons. This translates to a whopping 8000 miles of string a year. Other fun facts: The crackers are kept in a 300-foot-long oven for about four minutes, which means they’re baked at a rate of 12,000 per minute. 6. THERE HAVE BEEN 54 ANIMALS REIMAGINED AS CRACKERS. It’s a virtual zoo out there, but Nabisco’s Barnum’s can claim to have developed the most animals of any brand with 37 different creatures over the years. Today, a 2-ounce box of Barnum’s contains 22 crackers featuring 19 different animals. 7. THE LATEST ANIMAL ADDITION, A KOALA, WAS CHOSEN BY POPULAR VOTE. To commemorate the 100th anniversary of their crackers, Nabisco sponsored a name-our-next-animal contest in 2002. The overwhelming winner was the cuddly koala bear, which beat out the penguin, walrus, and cobra as the animal most kids want to crunch into. 8. THE APPEARANCE OF THE ANIMALS HAS CHANGED OVER TIME. Until 1958, Nabisco's animal shapes were stamped from a dough sheet by cookie cutters, which produced outlines that were rudimentary at best. After rotary dies were installed, the cookies became much more distinct, with engraved designs that revealed a surprising amount of detail. The rotary dies are still used today. 9. THE MONKEY HAS BEEN THE ONLY ANIMAL TO WEAR CLOTHES. No one has been able to sort out why, exactly, the monkey appears in a pair of pants while all the other animals are au naturel, but it’s a been a hot topic of discussion on internet boards for years. In a 1998 episode of Buffy the Vampire Slayer, the clothing conundrum is mentioned in passing, when Oz rhetorically asks Willow, "Do the other cookie animals feel sorta ripped? Like, is the hippo going, 'Hey, where are my pants? I have my hippo dignity.'" 10. A 1990s PROMOTION ENCOURAGED KIDS TO CHOMP ON ENDANGERED SPECIES. Every child goes for the head first, which was what Nabisco execs were counting on when they revealed a special endangered collection of Barnum’s Animal Crackers in 1995 to benefit the World Wildlife Fund. The 16 at-risk animals featured in each limited-edition jungle-motif box included Komodo dragons, peregrine falcons, Hawaiian monk seals, and Bactrian camels. Greg Price, a product manager at Nabisco at the time, told The New York Times, "What do people like about animal crackers? Biting off the heads! Our hope was that children will line them up, match them up with the names on the box, learn about them and then decapitate them." 11. SHIRLEY TEMPLE SANG—INCORRECTLY—ABOUT THE CRACKERS. In the 1935 movie Curly Top, pint-sized actress Shirley Temple performed a ditty about the childhood favorite called “Animal Crackers in My Soup,” which Nabisco went on to use for many of its commercials in the following years. In it, she sings the lyric “monkeys and rabbits loop the loop,” but rabbits have never been among the furry friends included in packages of animal crackers—at least not those in Barnum's Animals packages.